When we travel overseas, bus is one of the common means of transportation, especially for private tour designed just for you and your families/friends. An intelligent transportation system (ITS) is an advanced application which, without embodying intelligence as such, aims to provide innovative services relating to different modes of transport and traffic management and enable users to be better informed and make safer, more coordinated, and ‘smarter’ use of transport networks. Ursalink industrial cellular router, combined with GPS + 3G/4G mobile communication and Wi-Fi applications, is able to provide wireless access for passengers during the trip. 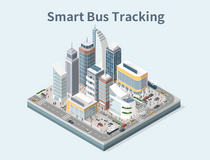 With Ursalink industrial cellular router deployed, the vehicle’s positioning information and IC card information can be transmitted to the monitoring center in real time, enabling the data service center to views the current position of the vehicle and makes efficient control of the bus. On the flip side, passengers can visit Internet service on mobile or Pad over 3G/4G or Wi-Fi network. They can also enjoy locally stored multimedia entertainment information such as videos, music, information and games, and further enhance the value of bus systems. Redundant Connections for Backup. Automated failover betweenWi-Fi and cellular (dual SIMs). Highly Reliable and Secure. Multiple VPN tunnels supports such as IPsec, OpenVPN, DMVPN, L2TP, GRE, PPTP for secure communication. Real-Time SMS/Email alerts if any issue occurs.